Discover, experience, live nature, that’s what makes children happy! Exercising and playing in the open air also brings the whole family together and inspires them to do things with one another. South Tyrol is a dream destination in this respect: the richly varying landscape offers numerous possibilities and exciting opportunities for a family holiday surrounded by nature, in the Dolomites for example. 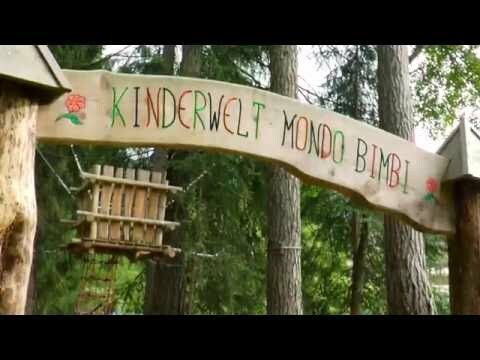 The new Kinderwelt in Valdoara is an extensive natural playground at the edge of the forest. It is situated directly on the Val Pusteria/Pustertal Bike Route and can easily be combined with a day trip by bike into the world of the Dolomites. WHERE can you find the Kids World Valdaora? Little adventurers will find the new MINISLIDE in the Kids World Valdaora (more precisely in the Water World). A new wood tower with a 13 meter long slide. Be ready to try it out! Also accessible for kinds under 10 years. Between the forest playground and the water world you will find the new tree houses above the ground. The houses are connected with climbing possibilities that guarantee a lot of fun. At the end of the course a slide will bring you back on the ground. The playground situated in close proximity to nature stretches out over several hundred meters and invites the whole family to test their abilities in the forest playground with its water world and climbing area. Whilst enjoying this, the children breathe the fresh, healthy forest air while simultaneously refreshing and strengthening their brain, their whole being in fact, with oxygen. The play trail is accessible with a pushchair. It is ideal as a place to go for a stroll or longer walk, a stop off point on a day trip to the Pusteria Valley, Lake Braies/Prags or the panoramic walk at Plan de Corones. In the water world you can find a baby changing space. Starting point is the elementary school in Valdaora di Sopra (street Aue 16), from there crossing the bridge, in about 5 minutes you can reach easily the Kids World. The Kids World can also be reached by bike following the Val Pusteria/Pustertal Bike Route until Valdaora di Sopra/Oberolang > forke to route “Brunico via panoramica”). City bus stop: elementary school, Valdaora di Sopra. The Kids World is open for everyone and the entrance is free. You can enter in the Kids World daily and it is open the whole day.